Cauliflower alternatives are becoming increasingly popular amongst people trying to substitute carbs and calories with something a bit healthier. They’re also a great alternative for those who are intolerant to gluten or just want to attempt to make their favourite dinner a bit less heavy. You may have heard of cauliflower rice, but cauliflower pizza bases are made in pretty much the same way and taste just as fabulous as the flour-based alternatives – you probably won’t even notice it isn’t the ‘real thing’ once it is smothered with all your favourite cheese and toppings anyway. It could be a great way to up your vegetable intake or feed any veg-phobic children without them even realising how crafty you are being. You may be thinking that, as cauliflower retains a lot of natural water and can go quite mushy, it is the last thing you would make a crispy pizza crust with. This recipe will prove you wrong! OK, so we might be biased here – but we really think this is the best cauliflower pizza base recipe you’ll find on the internet. It will make one 10-12” pizza, around 8 slices. Adjust the ingredients accordingly if you’d like to make more and be aware that the amount of cauliflower will reduce down. To make life easier, you can now buy ready-made cauliflower ‘rice’, which is especially handy if you don’t have a processor. This will just need cooking as per the directions (often simply in the microwave for a few minutes) and then follow the instructions onwards from step 4. It can also be adjusted into a vegan or dairy-free recipe – simply cut out the cheese and eggs and combine 50ml water and 2 tbsp ground chia or flax seeds, to create a thick ‘egg substitute’. 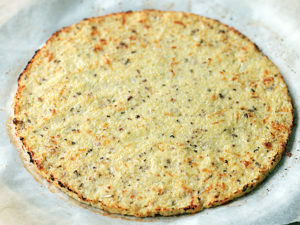 What does a cauliflower pizza base taste like? While cauliflower on it’s own has a very distinct flavour, once you’ve baked it into a pizza base form it only has a very gentle hint of it’s original flavour. So subtle in fact, it’s almost flavourless to eat – all the more reason to load up on your favourite sauce and toppings!